You can schedule tasks and appointments directly on the Yandex.Mail page using the Tasks service. To start using it, open Settings → Tasks, select the Show my Tasks in Mail option, and save your changes. Your list of tasks will be available in the lower right part of the page. Click on the icon to collapse the tasks list, and click in the area of the tasks list to expand it. By default, the service creates the following lists: Not to forget, Today, and This week.To create a new list, enter a name in the text box and click Create list. To edit the list, click . You can rename or delete the list in edit mode. Task lists created by default cannot be edited or deleted. Today and This week lists are created automatically and include tasks from other lists. You can also add tasks there manually, but you can't set the date and time. When tasks are finished, they are moved to the Completed list. To create a task, go to the required list, enter a name for the task in the text box, and click Add task. If you want to set a specific date and time for the task, click the dated link in the lower right corner of the panel. In the Edit task window, enter the date and time when you want to be reminded about the current task or meeting. Tasks scheduled for the current day are colored orange and overdue tasks are red. To edit a task, click on it or on the link to the right. You can change the task name and the date and time of the reminder in the Edit task window. If you have completed the task, check the box to the left of its name. The completed task will be deleted from the list. 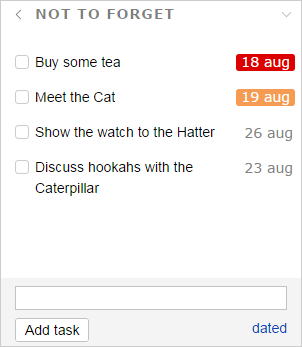 To return the task to the list, uncheck the box next to its name in the Completed tasks list. You can email task lists to your friends or colleagues. Just click on the icon next to the list name. Type the recipient's email address in the Send as message window. You can send the list to multiple recipients simultaneously. Just enter a few addresses and separate them with a comma and a space, for example: “cheshire.katze@yandex.com, just.mad.hatter@yandex.com, just.white.rabbit@yandex.com”. The recipient will see the list in the form of an html message with an attachment in ICS format that can be read by many calendar applications.